For the prepared condiment, see Mustard (condiment). For other uses of the term “mustard”, see Mustard (disambiguation). Mustard plant is a plant species in the genera Brassica and Sinapis in the family Brassicaceae. Mustard seed is used as a spice. Grinding and mixing the seeds with water, vinegar, or other liquids creates the yellow condiment known as prepared mustard. The seeds can also be pressed to make mustard oil, and the edible leaves can be eaten as mustard greens. It is not same as Salvadora persica, called “mustard bush”, which fits in the Parable of the Mustard Seed in the Gospel of Matthew 13:31–32, of Mark 4:30–32, and of Luke 13:18–21. Although some varieties of mustard plants were well-established crops in Hellenistic and Roman times, Zohary and Hopf note, “There are almost no archeological records available for any of these crops.” Wild forms of mustard and its relatives, the radish and turnip, can be found over west Asia and Europe, suggesting their domestication took place somewhere in that area. However, Zohary and Hopf conclude: “Suggestions as to the origins of these plants are necessarily based on linguistic considerations.” Encyclopædia Britannica states that mustard was grown by the Indus Civilization of 2500–1700 BCE. According to the Saskatchewan Mustard Development Commission, “Some of the earliest known documentation of mustard’s use dates back to Sumerian and Sanskrit texts from 3000 BC”. Mild white mustard (Sinapis hirta) grows wild in North Africa, the Middle East, and Mediterranean Europe, and has spread farther by long cultivation; oriental mustard (Brassica juncea), originally from the foothills of the Himalaya, is grown commercially in India, Canada, the United Kingdom, Denmark, and the US; black mustard (Brassica nigra) is grown in Argentina, Chile, the US and some European countries. Canada and Nepal are the world’s major producers of mustard seed, between them accounting for around 57% of world production in 2010. 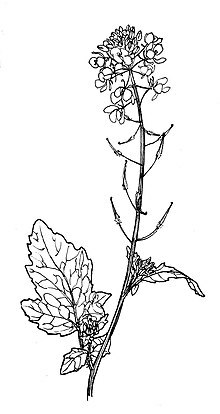 White mustard (Sinapis alba) is commonly used as a cover crop in Europe (between UK and Ukraine). A large number of varieties exist, e.g. in Germany, Netherlands, mainly differing in lateness of flowering and resistance against white beet-cyst nematode (Heterodera schachtii). Farmers prefer late flowering varieties, which do not produce seeds, they may become weeds in the subsequent year. Early vigor is important to cover the soil quickly and suppress weeds and protect the soil against erosion. In rotations with sugar beets, suppression of the white beet-cyst nematode is an important trait. Resistant white mustard varieties reduce nematode populations by 70–90%. Recent research has studied varieties of mustards with high oil contents for use in the production of biodiesel, a renewable liquid fuel similar to diesel fuel. The biodiesel made from mustard oil has good flow properties and cetane ratings. The leftover meal after pressing out the oil has also been found to be an effective pesticide. A genetic relationship between many species of mustard, along with turnips, cabbage, and their respective derivatives, has been observed and is described as the triangle of U. ^ Zohary, Daniel; Hopf, Maria; Weiss, Ehud (2012). Domestication of Plants in the Old World: The Origin and Spread of Domesticated Plants in Southwest Asia, Europe, and the Mediterranean Basin (Fourth ed.). Oxford: University Press. p. 139. ^ “Indus civilization”. Encyclopædia Britannica. Encyclopædia Britannica Online. ^ “What is Mustard?”. Saskatchewan Mustard Development Commission. Mustard Consumer Website. SMDC 2011. Web. 16 March 2016 < “Archived copy”. Archived from the original on 2016-03-25. Retrieved 2016-03-16. CS1 maint: Archived copy as title (link)>. ^ “FAOSTAT Countries by Commodity”. UN Food and Agriculture Organization. Retrieved 2012-05-08. ^ “Industrial mustard crops for biodiesel and biopesticides” (PDF). web.archive.org. 17 November 2004.